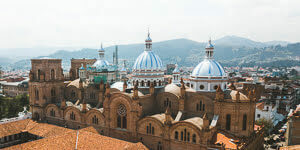 A year ago we left our home in LA to drive across South America in search of amazing destinations. After crossing into Chile we spent our first week driving through the dry northern desert. 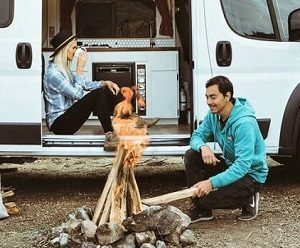 Within a few days of non-stop driving our “van fever” set in and we were itching to do some hiking and to spend some time outdoors. All signs seemed to point towards Villarrica, a remote region in the Andes mountain range. When we arrived in Villarrica we felt like we hit the jackpot. 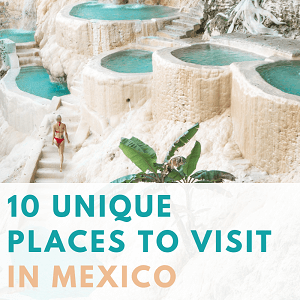 Filled with endless hiking trails, snowcapped volcanoes, freshwater lakes and a charming small town vibe, we spent over a week exploring this area. 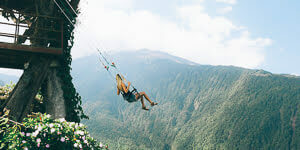 We quickly learned that one of the most popular activities in this region includes ascending the Villarrica volcano, one of the most active volcanoes in South America. But with a conservative travel budget, we couldn’t really justify dishing out $150 USD for a day hike (as cool as it sounded) especially when the Villarrica National Park offers so many other amazing hikes that cost less than $10 USD per person. 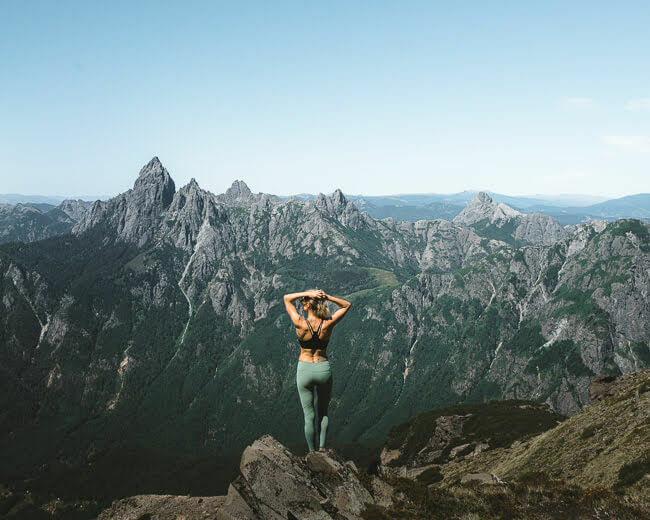 If you’re looking for some cool things to do around Villarrica and Pucón, here are some of the top hikes in this area that won’t break the bank, but will leave you with sore legs and a satisfied heart full of outdoors adventures. 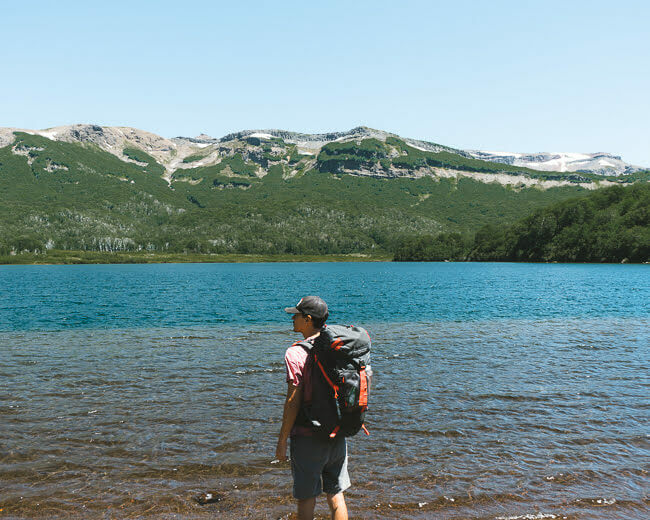 Pichillancahue Glacier trail is one of the best day hikes to do in the Villarrica National Park. 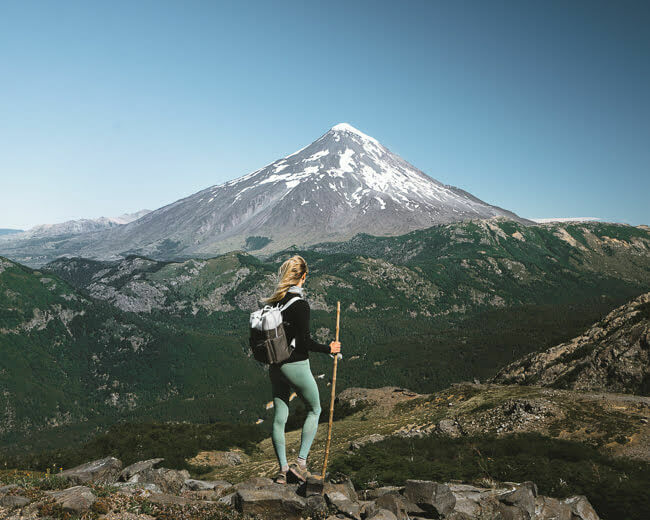 With little elevation gain and amazing views that lead through a volcanic terrain with the smoking Villarrica volcano as the backdrop, this trail is a favorite for many visitors of this park. 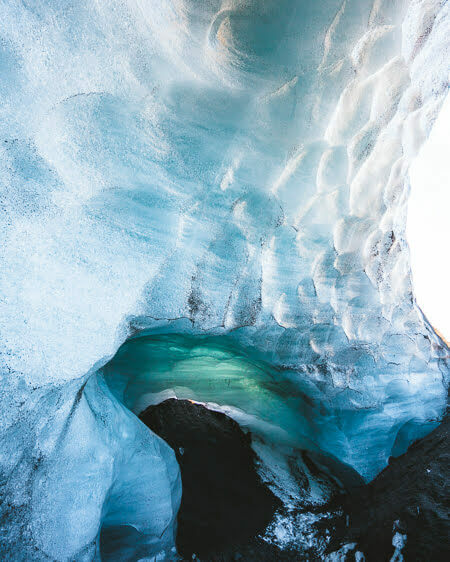 The hike ends at the Pichillancahue glacier and visitors can even take a peek inside the glacier caves, something we had never done on our travels before. 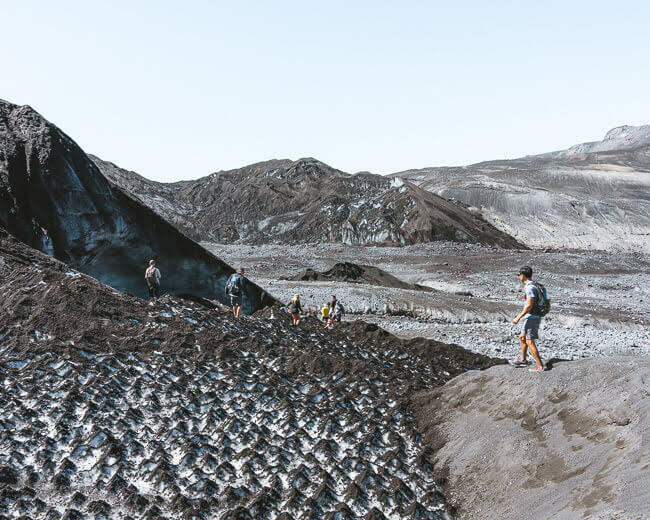 The Pichillancahue Glacier trail is 5.2 miles long (8.4 km) roundtrip from the trailhead and can be easily done in one day from Villarrica or Pucón towns. It’s the perfect day hike for the entire family. We saw kids, grandparents, and parents with babies sleeping on their backs during this hike. 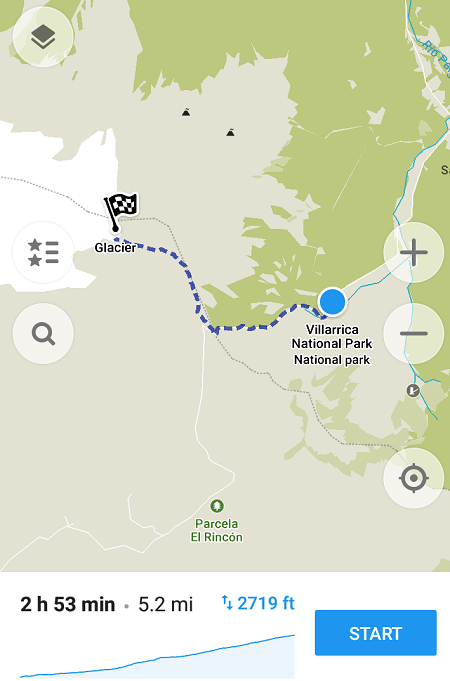 The Pichillancahue Glacier hike is not very tough but there are some things you should know before heading out on this trail, especially since most of the trails at Villarrica National Park are not marked on Google Maps and there aren’t many signs at the park indicating which way to go. 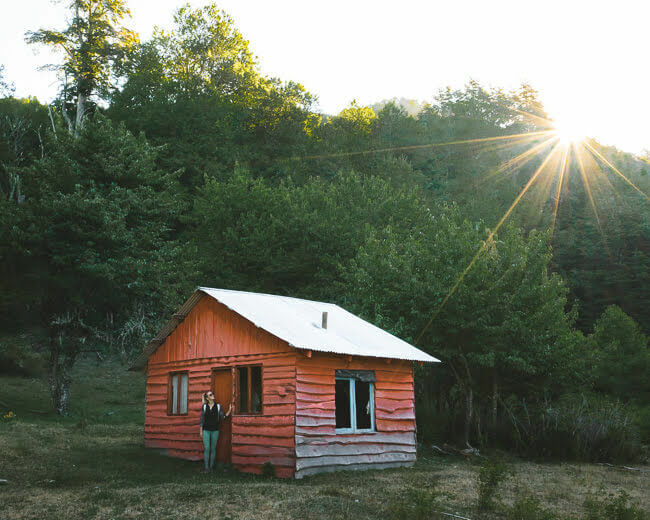 There also isn’t much reception once you leave Pucón or Villarrica towns so make sure to look up directions ahead of time. 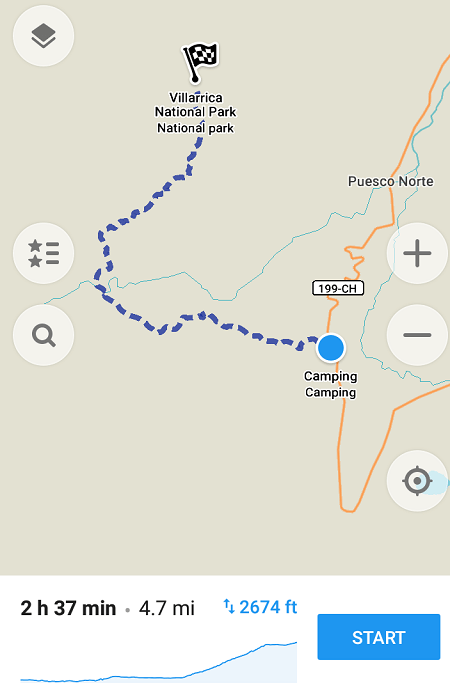 Tip: For hiking trips, I highly recommend to download Maps.me app. 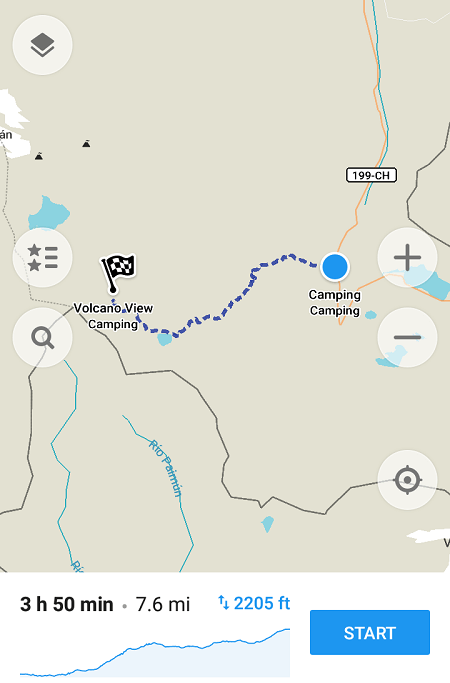 It’s a free app that shows hiking trails even offline. In case you ever get lost, this app can be a total live saver! 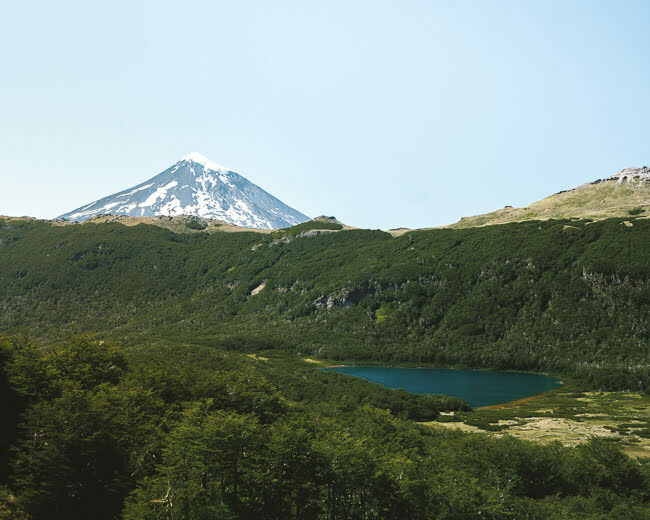 The entrance to the Villarrica National Park is located at the ranger station about an hour drive from Pucón. The park fee to hike the Pichillancahue Glacier trail is 5000 Chilean pesos (around $7.50 USD) for international visitors and 3000 Chilean pesos ($4.50 USD) for locals. The park ranger who is in charge of this trail will collect the fee either at the ranger station or on the trail. He typically walks the trail few times a day so make sure to bring enough cash with you to cover the trail fee. The ranger station is located a few miles before the Pichillancahue Glacier trailhead but the roads just before the ranger station were in a really bad shape and we could not drive all the way to the trail starting point. Instead, we parked our car in a small clearing in the woods just before the ranger station and hiked the extra few miles to the Pichillancahue Glacier trailhead. It added a few more hours to our hiking time but we didn’t mind it since the hike was relatively flat through a nice forest terrain. Unless you have a vehicle with a 4WD and really good clearance, I highly suggest not attempting the road past the ranger station. The ditches are deep and can easily get your car stuck or flipped over. Tip: We heard from some other hikers that there is a closer parking lot coming in from south that’s only .5 miles away from the Pichillancahue Glacier trailhead. It would make your drive much longer since you would have to go all the way around the park to get there, but it would save you from hiking those extra few hours. The Pichillancahue Glacier trail starts next to a parking lot in the woods. If you can make it through with your 4WD car, this is where you can park. To start the hike, look for signs that read “Glacier Trail”. The trail starts off in a forest terrain where we noticed these really cool Araucaria trees that look like giant pine trees with huge spikes. 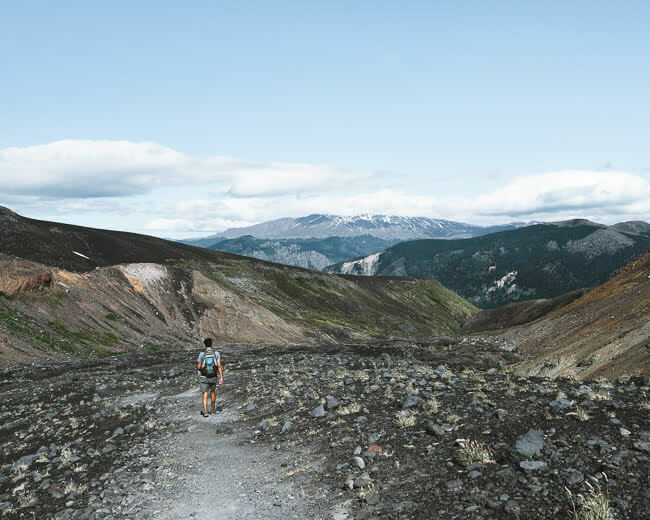 Soon after the trail will pass the tree line and continue along a bare volcanic landscape with views of the surrounding volcanoes. As we ascended towards the glaciers, I could feel the crunchy volcanic sand under my feet. The volcanic rocks on this trail are super light and airy, a type of rock that is formed from an explosive eruption. We could even see the Villarrica volcano smoking in the distance. 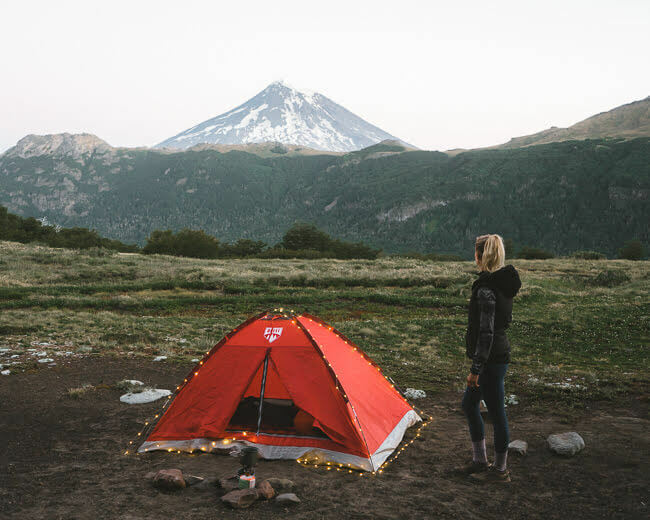 It’s not unusual – Villarrica is one of the most active volcanoes in Chile and just in 2015 it erupted leading to an evacuation of over 3000 locals. During the hike, we had to cross a small river forming from the glacier water. Normally we would bring a water filter with us and try to fill up on the water along the trail but this water looked too ashy mixed with the black volcano sand so I highly recommend bringing enough of your own water on this hike. The hike ends at Pichillancahue glacier. The glacier itself was covered in black volcanic ash but we could see peeks of blue ice underneath. We walked around the glacier and found a few caves that were easily accessible. 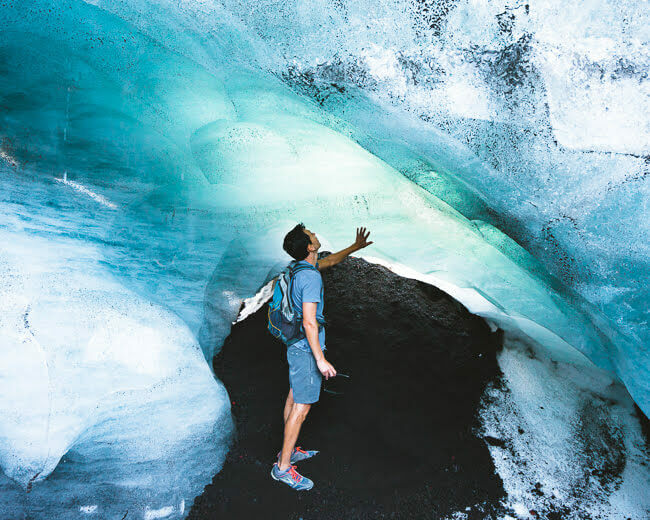 I can now say that I have checked off “walking in a glacier cave” from my bucket list! We did this trail in January which is the high season for visiting Villarrica National Park. In Chile, the seasons are backward with January being the hot summer season. We hiked this trail in the middle of the day and the weather was very warm and sunny. 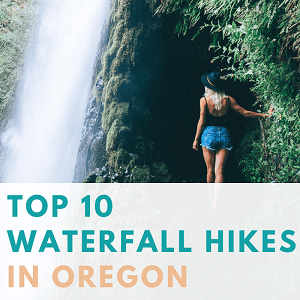 Bring plenty of sunscreen and water on this hike – there are no drinkable water sources on this trail. 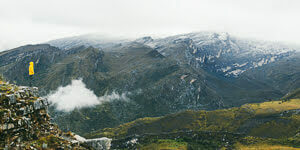 For the Pichillancahue Glacier hike I highly recommend wearing layers. Most of the hike was in an open hot terrain but once we reached the top it got very windy and there wasn’t much to shield us from the wind. Make sure to bring a light jacket and good hiking shoes. Beyond that no special hiking equipment is required. After hiking the Pichillancahue Glacier, we felt pretty good, so we wanted to step it up a bit. We talked to a few local park rangers in Villarrica and they suggested for us to do the Quinquilil volcano hike next. The Quinquilil volcano trail is located on the east side of the Villarrica National Park, one of the least visited areas in this region. Ascending the Quinquilil volcano is still a day hike, just a bit tougher and further from Pucón and Villarica towns. The Quinquilil volcano trail is 9.4 miles long round trip (15 km) and takes around 7-8 hours to hike. 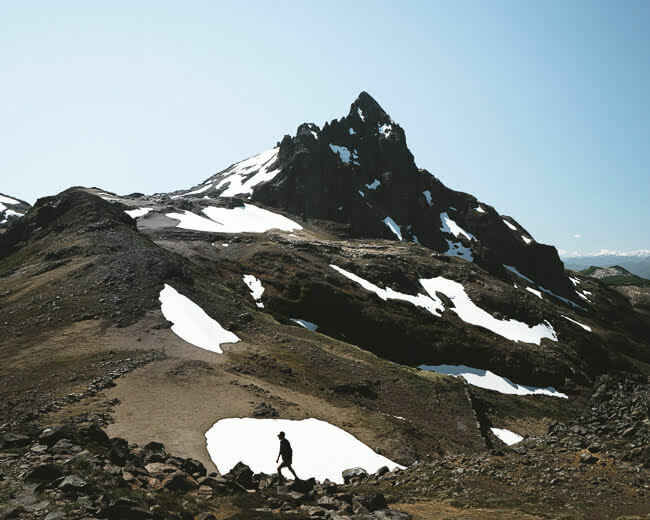 The Quinquilil trail is longer and more challenging than the Glacier trail but it can be done in one day. From all of that extra work comes extra reward. 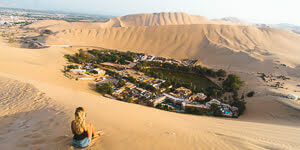 The trail ends at an incredible panoramic viewpoint of the surrounding volcanoes. The Quinquilil trail starts right off the main Highway 199. You can park your car in the designated lot around 2 miles past the ranger station and head into the trail from there. Unlike the glacier hike, the park rangers wanted us to pay at the ranger office instead of collecting the money on the trail. For hiking this side of the park we paid 3000 Chilean pesos (around $4.50 USD) per person but we had heard of other people paying different fees. The fee-paying process at Villarrica National Park was a bit confusing and we couldn’t always get clear answers on it. After you enter the trail the first 1.7 miles goes through flat, dry forest terrain. In about 40 minutes the trail will split off into two. Follow the signs to turn right to continue along the path towards Quinquilil volcano. Soon after the turnoff, you will reach a chained gate. Continue past the gate and turn right again at the next sign to follow the trail. About an hour into the hike you will reach a river that will be the last water source of the trail. If you have a water filter, I highly recommend to fill up on water at this river. There will be a small bridge made of tree branches to help you cross the river. Once you cross the river, the trail will disappear for a bit into a pebble section but go towards left until you spot the trail again. This is where the fun (and intense climb) really starts. For the next two hours, you will be hiking through some really challenging switchbacks in the forest. The trail will get super narrow and it doesn’t seem to be cleared much. If you have a pair of hiking pants, I highly recommend to wear those so your legs don’t get cut up from the tree branches. After two hours of traversing you will emerge above the tree line and finally you will be rewarded with those amazing views that you had to work so hard for. From there you can continue along for another hour up until you reach the end point of the trail with an incredible viewpoint of the Quinquilil volcano. From this trail you can also spot the impressive Lanin volcano and the Las Peinetas jagged peaks in the distance. In total, the Quinquilil volcano hike took us around 4 hours up and 3 hours down plus time spent at the top gazing at the views with our jaws dropped open. The weather on this hike was really hot until we got to the top. It seems that in the afternoon the wind picks up quite a bit so bring along a light jacket that you can throw on. The only downside of this hike was the relentless horse flies that followed us for the entire trail. These flies are quite large and their bites can be pretty painful even through clothing. If you have any type of bug repellent, I highly recommend to spray yourself before the hike. Most of the trail was pretty dry and sandy causing us to slip a lot during the way back down. 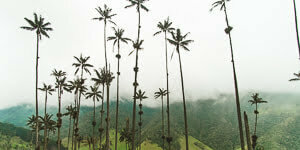 If you have any type of walking sticks, I also recommend to bring those along. 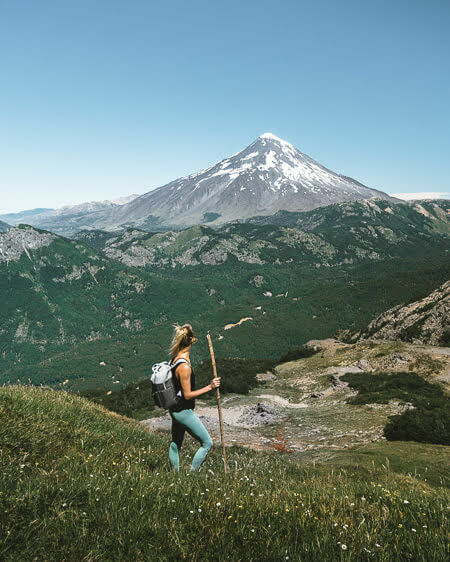 For the ultimate hiking experience around Villarrica and Pucón, the Villarrica Traverse trail covers the entire park West to East. Hiking the entire Villarrica Traverse trail can take anywhere from 3-5 days, depending on detours to different viewpoints. Although we would have loved to backpack the entire Villarrica Traverse trail, we opted to do a 2-day day backpacking trip in the east portion of it. We had already hiked the two trails mentioned above and our legs were slowly turning into jello. Our out of shape “van bodies” couldn’t handle much more than that! We decided to backpack the Villarrica Traverse trail up to a volcano viewpoint just past the Las Avutardas Lake (also called Laguna Los Patos on Google Maps). This trail portion could be also done as a long day hike but we really wanted to spend a night camping outdoors underneath the stars. Most people hiking the Villarrica Traverse trail start from Pucón, but we decided to hike a portion from the other end of it. The Villarrica Traverse trail starts at the same spot as the Quinquilil Volcano trail, right off Highway 199. In around 1.7 miles (around 40 minutes) from the trailhead, you will reach a point where the trail splits off into two. Follow the trail towards the left to hike the Villarrica Traverse. After the turnoff, the trail will start ascending through a forest for the next few hours. The elevation gain wasn’t too bad, but the backpacks made us a lot slower than during the other day hikes we did in this area. After almost three hours of huffing and puffing through the narrow forest trail we reached the Los Avutardas Lake. Without any clear tracks leading to the waterfront, we made our way across a swampy grass area until we found a tiny trail overgrown with shrubs with access to the lake. If it wasn’t for Maps.me app, we would have totally missed this access point. Surrounded by mountains with a deep blue color, the Los Avutarda Lake was quite the nice stop. This is also the first stop with access to fresh water where hikers can fill up on drinking water. Many people camp at The Los Avutarda lake, but we opted to continue on in search of better volcano views. We made our way back to the main trail and kept chucking on. Soon after we passed through an open grassy field marked as “Zona Pantanosa” which in direct translation means “Swampy Area”. It wasn’t too muddy but waterproof hiking shoes were super helpful to keep our feet and toes dry during this portion. We kept hiking through more switchbacks until an hour later it flattened out at the top. We had reached a viewpoint of the Lanin volcano in the distance with more viewpoints of the Quinquilil volcano just around the corner. It took us around 6 hours to reach the volcano viewpoint at the top where we camped including an hour stop by the lake. The hike down the next day was much easier and only took us half the time. We were sore, dirty and in need of a shower but also happy and satisfied from hiking nearly 35 miles in the Villarrica National Park. We visited Villarrica in January which counts as their “summer” season. The days were hot and sunny but the nights quickly dropped temperature as soon as the sun went down. Backpack: I use a 46 Liter backpack from REI. It fits everything I need to bring without being too heavy. Light tent: on this hike, we used a basic tent from REI. The weather on this hike was so great that we didn’t need anything beyond a simple, lightweight tent. Sleeping pads: on the past backpacking trips we always used roll-up foam pads but on this trip, we upgraded to inflatable sleeping mats and it made such a huge difference! For the first time on a backpacking trip, I didn’t wake up with soreness in my bones from sleeping on the cold ground. 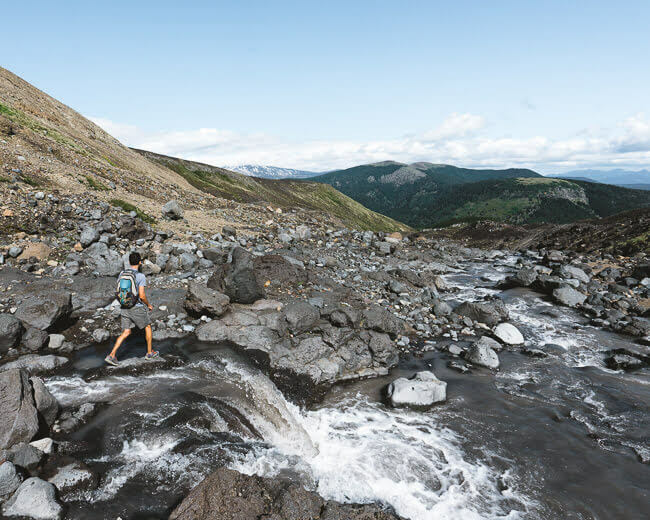 Waterproof hiking shoes: you’ll be hiking through some mud so waterproof shoes are a must to keep your feet and toes nice and dry. Long pants to protect your legs from getting scratched on overgrown bushes and shrubs. Layers for tops: a t-shirt for the day and warm thermos for the night. Warm jacket for night time. Gloves, beanie, and extra socks for night time. Small cooking set with a mini pot and burner for making food. Enough food for two lunches, dinner, and breakfast. Lots of water: for the first 3 hours of the hike we didn’t have any access to a water source until we got to the Los Avutardas lake. Sunscreen: during the warmer seasons the weather in Villarrica is very sunny. Avoid sunburns by bringing along a strong sunscreen. Bug repellant: while hiking at Villarrica National Park, we were non-stop followed and attacked by relentless horseflies. If you have any bug repellent, you may want to bring some along with you on these hikes. From what I have heard, the Avon Skin-So-Soft works best for horse flies compared to other bug repellants – I really wish we thought about bringing some with us ahead of time. Hiking sticks: some of the trail parts coming down were very dry, sandy and slippery. Emergency kit, an outdoors knife, and a flashlight: I bring these items on every hike I go on, even day hikes. 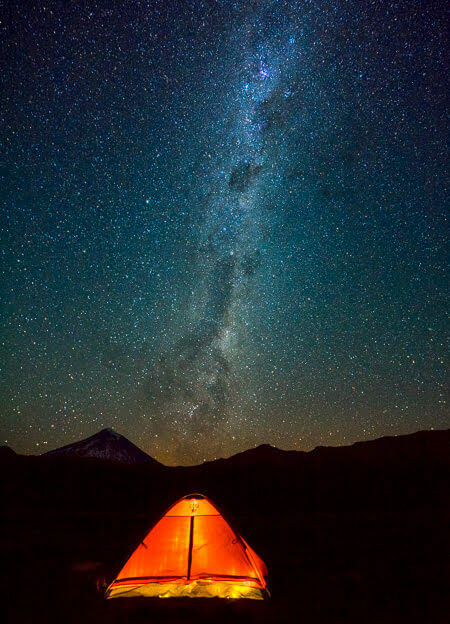 Villarrica National Park is open all year long but the buiest time is from December to February – Chile’s summer season. The official park opening times in the summer are between 8 am to 10 pm. As a rule, the Villarrica National Park does not allow dogs (although legally there is currently no law against it). Bringing dogs into this park can cause a serious danger to the wild foxes. The foxes at Villarrica National Park are not immune against diseases that dogs carry so when people bring dogs in this park, the wild foxes pick up their germs and sadly die. The park has a very dry climate and therefore fires are not allowed. A fire that’s started in the wilderness can be quickly picked up by wind and spread around. Please be mindful of that and don’t start fires in the wilderness. Leave no trace behind – please pack out any trash that you pack in. The park only has a handful of rangers attending to the trails so please keep that in mind and carry out anything that you carry in.